Not many players were as intimidating during their National Hockey League career as Joe Kocur. In a career spanning 15 years with the Detroit Red Wings, New York Rangers and (briefly) the Vancouver Canucks, arguably Kocur was the fiercest. It was his right fist. Kocur threw it in an incredibly swift and repetitive manner. Kocur won most of his fights, an inordinate number of them by knockout. Even the NHL’s toughest fighters were fearful of Kocur. His punches were so punishing they often caused genuine injury. “One thing you hear a lot from the players in the National Hockey League when Joe Kocur played is that he didn’t just hit you, he hurt you,” said Ken Kal, the longtime radio play-by-play voice of the Red Wings. The classic example was in 1988. A Kocur overhand right resulted in Winnipeg Jets’ defenseman Jim Kyte, who was much taller than Kocur (6-foot-5 compared to 6-foot) being knocked unconscious. Those in attendance that night at Joe Louis Arena feared Kyte might have been killed, and breathed a collective sigh of relief when they found out he was OK. There are a number of Kocur’s fights on YouTube. Yet, the much fewer goals displayed are a testament to Kocur’s hockey skill, particularly his tally during Game 1 of Stanley Cup finals in 1997. Kocur picked off a pass deep in the Philadelphia end, sent Flyers’ goalie Ron Hextall one way with a move, and lifted a back-handed shot in the other direction. The water bottle sitting on top of the net flew up. It was remindful of Igor Larionov’s goal in Game 3 of the 2002 Stanley Cup finals vs. Carolina – a real beauty off the backhand. A 1-1 deadlock early during the first period became a 2-1 Detroit lead. The Red Wings never looked back, capturing their first Stanley Cup championship in more than four decades with a four-game sweep. 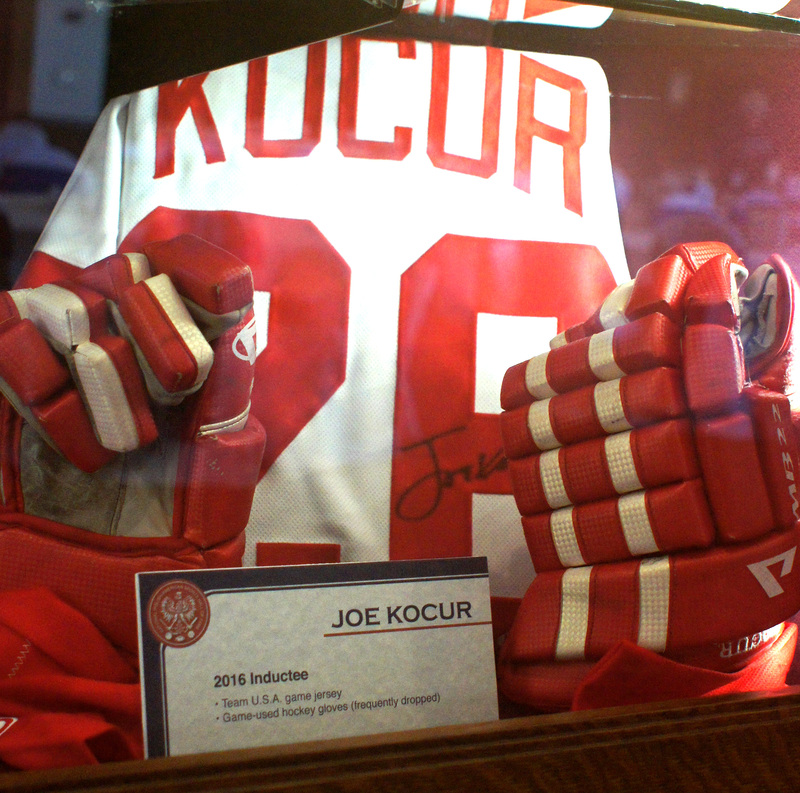 Kocur, who resides in Metro Detroit, is proud to be inducted into the National Polish-American Sports Hall of Fame. His grandparents immigrated to his native Saskatchewan from Poland. His grandmother, Helen, has been a particularly strong influence in his life. 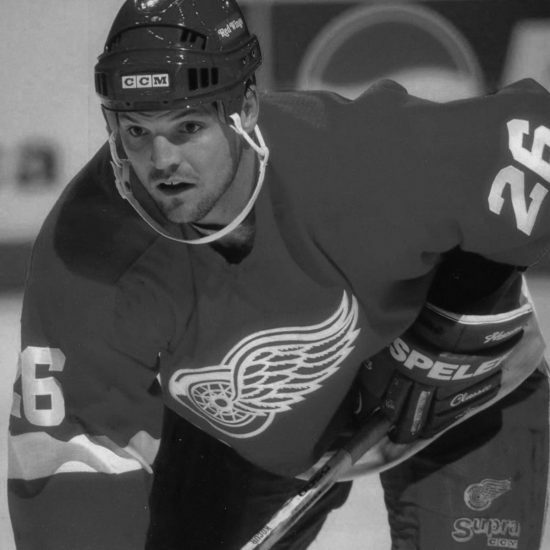 Kocur participated in 820 regular season and 118 playoff games during his NHL career, which started with Detroit in 1984, and ended in 1999, also with the Red Wings. Kocur was with the Rangers for six years, including playing a prominent role for the 1994 Stanley Cup champs. He is 20th all-time in penalty minutes with more than 2,500. He scored 80 goals and had 82 assists in the regular season, and 10 goals and 12 assists, in the playoffs. Kocur learned his enforcer role in junior hockey. A coach advised him to find a way to stand out. Fighting seemed to be the best way. He lost his first fight in major junior hockey. He was one-half of the “Bruise Brothers” for the Red Wings with the late Bob Probert, another feared NHL tough guy. They were in charge of the protecting the Red Wings’ growing roster of stars, especially The Captain, Steve Yzerman. Kal recalls a conversation he had with Kelly Chase, a noted fighter, mostly with the St. Louis Blues, during roughly the same span as Kocur’s career. Probert was just 45 when he died in 2010. Kocur treasures the times they played together. Kocur took on Probert twice as an opponent in fights. They became instant hockey classics. Kocur caught Probert with several good shots, but none of it was personal. Kocur is thankful for his time spent with the Rangers. Among his teammates was the great Mark Messier. It remains the Rangers’ only Stanley Cup title since the beginning of World War II. Kocur played in 20 playoff games during the run. But he admits it was even more special to hoist the Stanley Cup twice with the Red Wings in 1997 and 1998, along with so many of the players he broke into professional hockey with during the 1980s. Yzerman had requested the Red Wings bring back Kocur – and it wasn’t in a fighting role. He was part of the “Grind Line” with Kirk Maltby and Kris Draper. 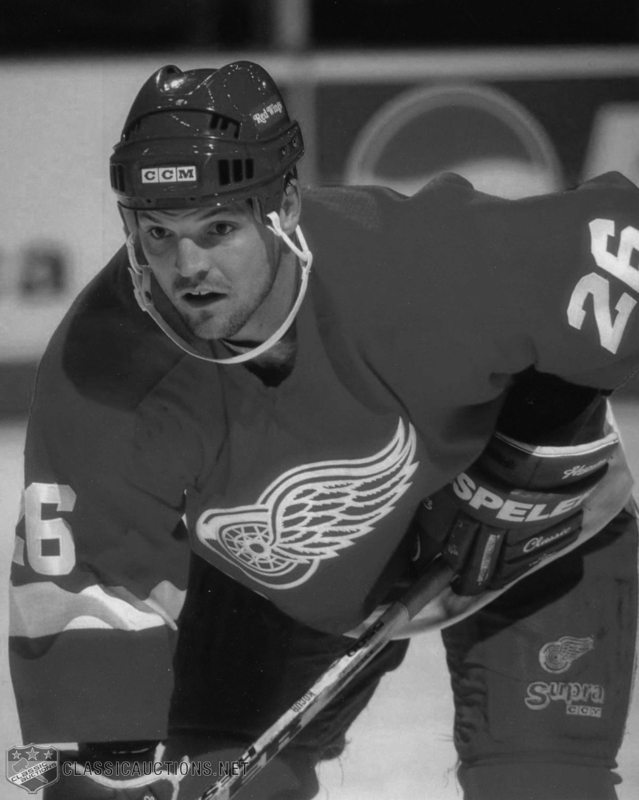 Kocur spent much less time in the penalty box after his return to the Red Wings. When he played, Kocur’s right hand often looked like it had been through a meat grinder. It was cut, bruised, bleeding and battered. He hit so hard, some even suggested he had a plate in it. Kocur said there a lot more rumors than reality about his famous right hand. Kocur still laces on the skates with the Red Wings’ alumni team. He is the organization’s president. His legend as one of the Bruise Brothers has only grown since retiring from hockey. He remains a popular fixture in the State of Michigan.